First recorded in use in 1281, the bascinet saw use for nearly 170 years before its decline, and even then, it was a favorite by warriors in tournaments. And this Medieval Bascinet with Face Plate demonstrates why it is such a great tournament helm. Reflecting the typical style of the bascinet helm, this medieval recreation features a rounded skull-cap with a subtle, swept-back point, which offers the unique feature of helping to guide blows away from the head. The curve forms a subtle, rounded point, which when struck, shunts the force off to either side, keeping blows from landing directly on the crown, while also guiding them down the side of the helmet. This particular model of bascinet features a visor, and on this version, that visor is offered as a full face plate, which features a hinge on the side, as well as small hooks on the cheeks for securing it in place. When worn, this visor covers the whole face, leaving only small holes in the metal to allow for warrior vision and ventilation. This full design makes the visor particularly good for events like jousting, where total protection takes precedence. The helmet is offered in one size. It is made entirely in 14 gauge steel, which is hardy, thick steel that is suited for SCA, casual reenactments, and fighting. The helmet also features an internal liner. 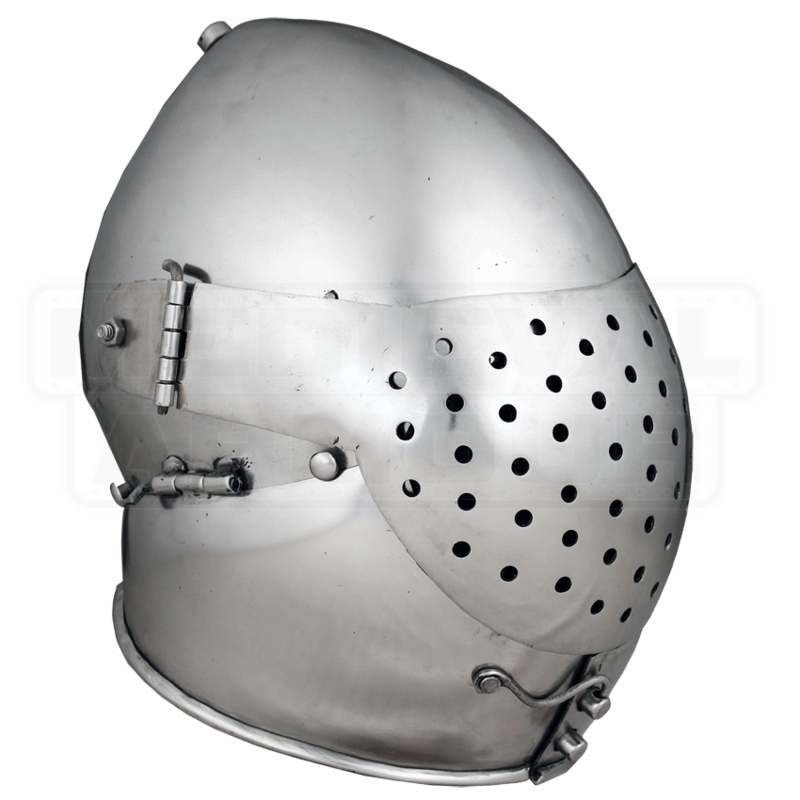 Hardy and altogether impressive in design, this Medieval Bascinet with Face Plate is the total protection that any warrior would crave when going into a reenactment, as well as the classic helmet to wear when it comes to completing your ideal battle-ready suit of knightly armor.